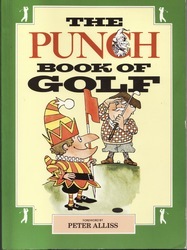 The Punch Book of Golf was published in 1986 by Grafton Books, a division of the Collins Publishing Group in London, England. The anthology "is the perfect companion to the nineteenth hole. It is a celebration of the royal and ancient game of golf as portrayed in a sparkling array of stories, articles, verses and over 200 cartoons from the pages of Punch". The cartoons shown below are all to do with Putting. To view a larger version of the cartoon, click on the thumbnail version. 1. Leslie Starke (1905-74) was one of the most inventive and best-loved cartoonists of his day. A Scot, his work was as popular in the USA as it was in Britain and his cartoons regularly appeared in such publications as the New Yorker, Collier's, The Saturday Evening Post and Esquire. 2. David Langdon, who was born in London in 1914, probably had more cartoons published in Punch than any other single contributor. His work has appeared widely in Britain and the USA and is notable for its economical, deceptively simple style. 3. Alex Graham was a British cartoonist best known as the creator of the cartoon strip Fred Basset, a male basset hound. The cartoon was published first in the Daily Mail on 8 July 1963. It has since been syndicated around the world. He died in 1991. 4. Hector Breeze was born in London on 17 November 1928, and educated at Dartford Technical College. He has since worked in advertising and produced cartoons for Private Eye, Punch, The Evening Standard, The Daily Mirror, The Daily Sketch and The Guardian. 5. John Whitfield Taylor was a full-time schoolmaster who also cartooned. He attended the University of Manchester, and was head of the art department at Portland House School. 6. Eric Burgin was born in Maidenhead in 1926. He began drawing cartoons in 1945, while in the RAF in Singapore. His first cartoon appeared in Punch in 1951, and in 1954 he became a full-time freelance cartoonist, publishing numerous cartoons in The Daily Mirror, Punch and other publications. 7. Cavalier - No information. 8. Russell Brockbank (1913-1979) was a Canadian-born cartoonist who spent much of his working life in the United Kingdom. He was best known for his motoring, motor racing and aviation cartoons. His work was published in numerous magazines and journals, including Lilliput, Motor and Punch. 9. Minet - No information.